Calling all Judy Niemeyer fans...This is a time to work on those beautiful Judy Niemeyer quilts that you have started and want to work on or need a little help to get you going again. Working on one of our JN BOM and need a little more time or help? This is a great day to join Anna as you work on your wonderful projects inspired by Judy Niemeyer! Wool applique and embellishment class for all stitching levels. Good beginner class. Learn 35+ embellishment stitches in this class, along with all the tips and techniques to be successful. Class taught sampler style ?- Learn the stitches and you decide how to use them on your project. This BOM includes pattern, all background wool and a collection of wool for the applique, plus class time to learn the stitches. Threads sold separately. Join Anna as you learn the process of paper piecing with Diamond Wedding Ring unit, including techniques to do different curves and strip piecing. Kits available in 3 color ways. Check out this Fun Class with Feature Teacher Jenny!!! In this introductory class you will learn how to use simple shapes of animals and objects to create a fabric collage. Similar to our UFO for quilts, but for wool applique and embellishment. Bring your own project and enjoy the companionship of other wooly ladies. We will feature 2-3 stitches per month from the Sue Spargo book, Creative Stitching, plus some others. We will be available to help you with your project and learn the stitches. This would be a good time to get extra help on your wool Block of the Month projects. Be sure to reserve your spot each month. We have been seeing these all over Instagram and have loved them. Joan will walk you through this fun process of taking one Jelly Roll or Bali Pop, with left over batting and making a rug to put any where in your home!! Join Anna to create these modern Dresden in fun designs, shapes, and quilt projects!! Love that classic Hunter Star? Traditionally achieved with template piecing, now you can make this quilt even faster using a new ruler by Studio 180 Design. 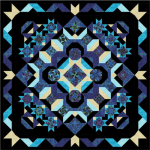 There are different layouts available to achieve unique quilts. This is a great small project to help you learn Judy Niemeyer?s Technique in paper piecing. You will learn the basics plus how to do a vein or curved paper piecing. We have a couple color ways available in kits. Have you ever admired our wonderful samples with the amazing machine button hole stitch? Please refer to our newsletters or to sign up please contact usfor more information. If you can't make the class we can mail out your monthly kits! What is better than mixing Quilting and Cake??? Join us for this new style BOM? Take one Layer cake, 5 yds background, and some Cake Mix Recipe papers and Make a unique Sampler Quilt. 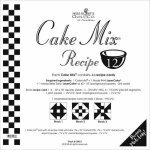 Each month packet you will receive the Cake Mix papers, a pattern to make a quilt with that months Cake Mix, Block instructions, and a recipe for a yummy cake. (The last month you will receive patterns of different layouts to finish your quilts) $3.00 to get you started and if you bring your finished block to the next month demo you will get the next packet free! !